15 November 2018 – In her second blog post inspired by the hashtag#SingTheCity fundraising walk for Gauteng Opera, Liz Belmont puts the spotlight on people and developments that make inner city Jozi come alive. She highlights Jozi’s walking tours, private developers and pioneering and steadfast entrepreneurs. Walking tours are also part of a global phenomenon, giving a more in depth insight of specific locales in a city, as opposed to the introductory overview of a SightSeeingCity Bus tour (which I still think is a great solution if there is limited time). In a previous blog I wrote about the wonderful #SingtheCity walking tour with Flying Cows of Jozi, a fundraiser for the Gauteng Opera. 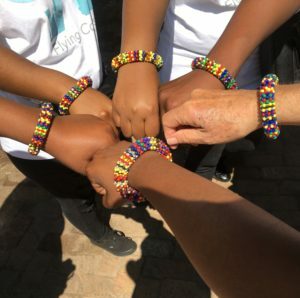 Before setting off, we were each given a colourful bracelets as tour leader Josine Overdevest said there were at least 2 other tours in the area that morning and she didn’t want us to tag on to the wrong group. Both Griffin Shea of Bridge Books (a little gem of an indi bookstore on Commissioner Street), as well as Gerald Garner of Joburg Places were leading tours. Gerald, the pioneer of walking tours of Jozi inner city, has a phenomenal knowledge of the CBD which has resulted in his publishing 2 books on the city. He has also played a central role in the development of key urban regeneration sites including The Sheds at what is now known as 1 Fox Precinct as well as Joziburg Lane at 1 Eloff Street. He’s moved on from both these sites and has recently launched the ThunderWalk Project at Somerset House on Gandhi Square and is offering enigmatic dinners at the underground bar, Zwipi. Plus, he recently hosted a Mozambiquan beach party outside Somerset House on Gandhi Square. Now you have to admit these are out of the ordinary events!! There are many walking tours which all have a slightly different focus so check their websites out: Main Street Walks; Past Experiences; Dlala Nje; JoburgHeritage; Lucille Davie Walks; and the annual Jozi Walks. They have all, in their own way, created interest in Central Jozi among both international visitors as well as locals who long fled the grit of Jozi Central for the glamour of Sandton. Next: Next post: Graduation celebrations!